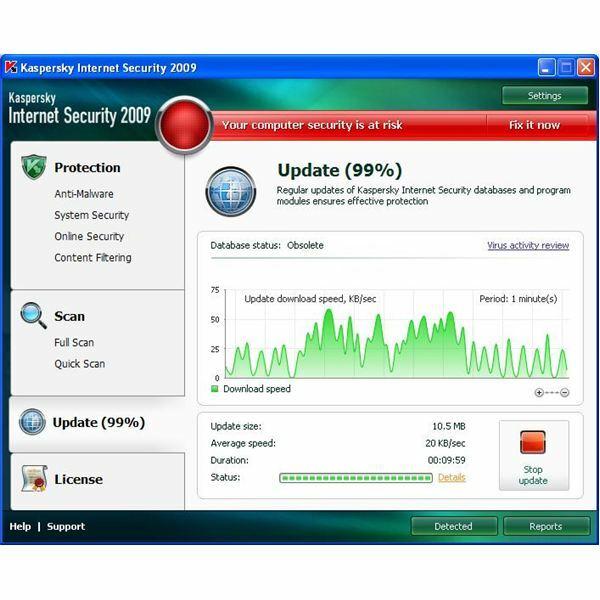 Kaspersky Internet Security 2009 Provides Excellent and Comprehensive Protection. 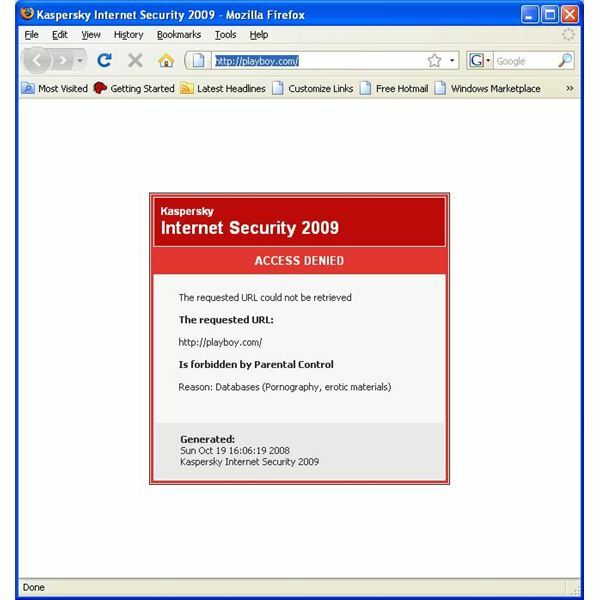 The suite of protection offered by Kaspersky Internet Security 2009 is impressive. Ranging from basic anti-virus protection to advanced application integrity monitoring, Kaspersky raises the bar by also including several lines of support, including phone support from 8am to 9pm. Kaspersky scans web traffic in real time for malware, blocks annoying advertisements, and updates its database hourly, which should help prevent against the computer being infected with newer malware. Considering that each of these abilities could be sold individually as separate products, I believe the Kaspersky suite offers good price to value ratio. The only reason I don’t rate it excellent is that the $79.95 price tag may put it out of reach of some potential customers. Downloading and installing Kaspersky was very straight-forward. Simply download the executable, double-click, and the installation wizard starts and prompts you for the basic information that it needs to install, including the key. After installation, the computer must be rebooted for Kaspersky to take affect. After the computer reboots, the application first tells the user that they are at risk, however, this screen only means that Kaspersky needs to update its internal database. During the update, the progress indicator remained at 99% for what seemed to be several minutes, and I briefly wondered if the application was hung up or if it was still working. Kaspersky also includes its own logging monitor, so I was able to open that up and view each file being downloaded in real time as the application database was updated. Only once since installing Kaspersky have I noticed any performance hit, and that was during the first full system scan. On my test system, a quickly aging Acer Aspire 1640 (Win XP Pro, SP3, Intel Pentium M 1.73GHz, 1G RAM), I have not seen any noticeable lag in application launch time or in response time from the overall system. Performance, or the lack of any noticeable impact on performance is extremely important in this genre of application because if the responsiveness of the system goes down, or worse, the application locks the system up, then the application is going more harm than good. Kaspersky gets around this problem by being almost invisible, and running silently in the background. Exactly what its supposed to do. Kaspersky provides a very simple interface that hides the complexity and the power of the application underneath. The main screen provides four options to the left, being Protection, Scan, Update, and License. The first three make sense, I’m not sure why there is a section dedicated just to the license. In the License screen you can see when your license expires and, if necessary, go to the Kaspersky web site to renew it. What I really like about the application interface is the large color coded bar at the top, which tells you in bold lettering if your computer is protected or not. When there is a problem, the bar is red, and when everything is running smoothly, the bar is green. Overall the user interface is logical and easily navigated, but I did have to hunt around a little at first to find the settings. I turns out that the settings window is the same if you click on the "Settings" button at the top of the main screen or if you click on on of the options and select "Settings" from the contextual drop down menu. Kaspersky provides basically two forms of support: DIY and interactive. Those are my own terms for the offical support channels of Kaspersky, three of which I call DIY because they involve the user searching through the interactive help included with the application, searching through the online knowledge base hosted at the Kaspersky web site, or asking a question in the online forum, also hosted at the Kaspersky web site. The availability of these forms of help is fairly standard, what sets Kaspersky apart is the ability to get interactive help during working hours from support staff through either live chat or over the phone. I was very impressed to see phone support listed as an option, and then less so to see that the support was only offered from 8AM – 9PM. You know for a fact that things requiring support mainly happen at 1AM on a Sunday morning. With that being said, it is still impressive to see phone support offered as a standard option in an application geared towards home or home office users. As a personal note, I’m very impressed so far with the web filtering abilities of the application. Kaspersky supports both Internet Explorer and Firefox, and does very well at recognizing both annoyances like flashy banner ads and inappropriate content. The computer which I use to test applications for review is also the computer that my kids use for homework, so the inclusion of parental controls was a big plus for me. Enabling the parental controls prompts the user for a password to secure the application, after which any change to application settings must be authenticated with the password. I use the parental controls to filter web access, and also to limit the hours that my kids can be online, and how much time total they can spend online. So far, everything works as advertised, and for this machine,that’s a very big deal. As a general rule, I really do not like spending money on anti-virus software. That’s one of the reasons I like this suite so much, it is not just anti-virus, but a complete security solution for a PC. I have only skimmed the surface of all of the features available in thsi software, for complete details, you can visit their website. I’m very pleased with Kaspersky Internet Security 2009 thus far, and barring any future problems, I fully expect to be renewing my license next year. Kaspersky may not be as well known as competing products such as Norton Internet Security, but it’s every bit as effective. A simply great product! Would you like to read more reviews? Look around Bright Hub and you’ll find reviews of numerous other anti-virus solutions including Norton Internet Security, ESET Smart Security, McAfee Total Protection, Blink Professional and ZoneAlarm Internet Security Suite.